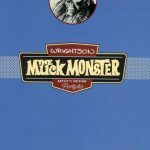 I am not a person who enjoys the sombre cocooning that winter imposes on us pensioned comic geeks–and this year we are having a real, old-fashioned winter. You young whippersnappers might call this an Arctic Vortex, but to those of us who remember seeing AF 15 on the stands, this is what winter was always like. In terms of ongoing work, the design of Heroes of the Home Front is progressing a little bit more slowly than expected, but it’s all in the detail of making it the book we want to present, and we are in the very last stages. It’ll be at the printers next month and I expect to do a run of between 400-500 copies, with about 250 spoken for through the Kickstarter. I also want to mention that we’re nearing the completion of the first comprehensive checklist and price guide for Canadian war time comic books. 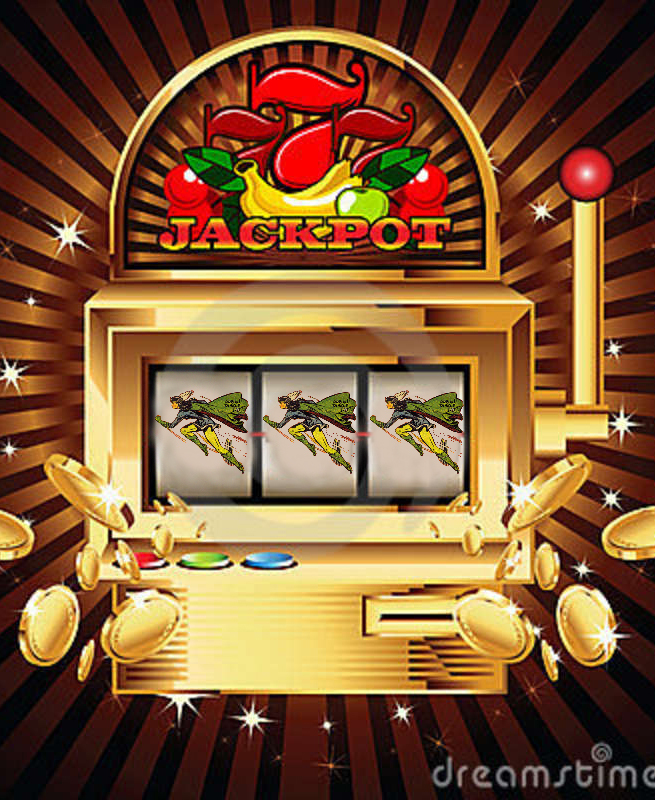 It contains details and price values for 780 WECA comics. Here is a draft of the front cover with a great painting of Speed Savage by Ken Steacy and a sample page from the listings. The dimensions will be roughly those of the Overstreet guide and it should span about 100 pages. 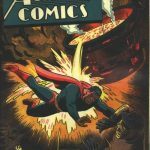 In connection with working on the price guide, I decided to take a look at the CGC Census numbers for slabbed WECA comics. There are just over 700 slabbed WECA books spread across all the titles and individual issues. Roughly 500 or over 60% of the 780 or so individual books that comprise the WECA run have no slabbed copies and no single WECA comic has more that 8 slabbed copies. 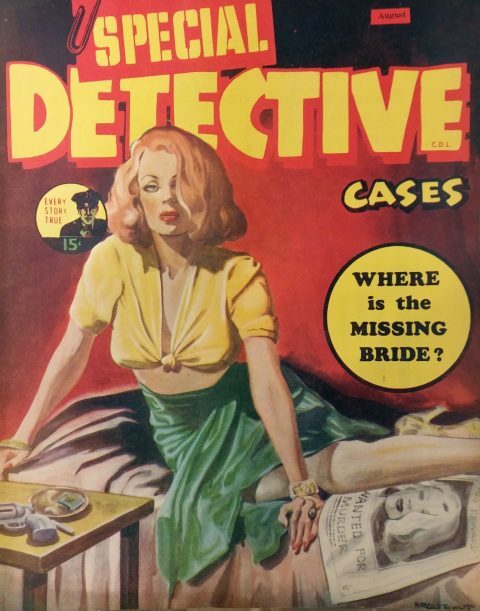 The issue that has 8 slabbed copies may come as a surprise. 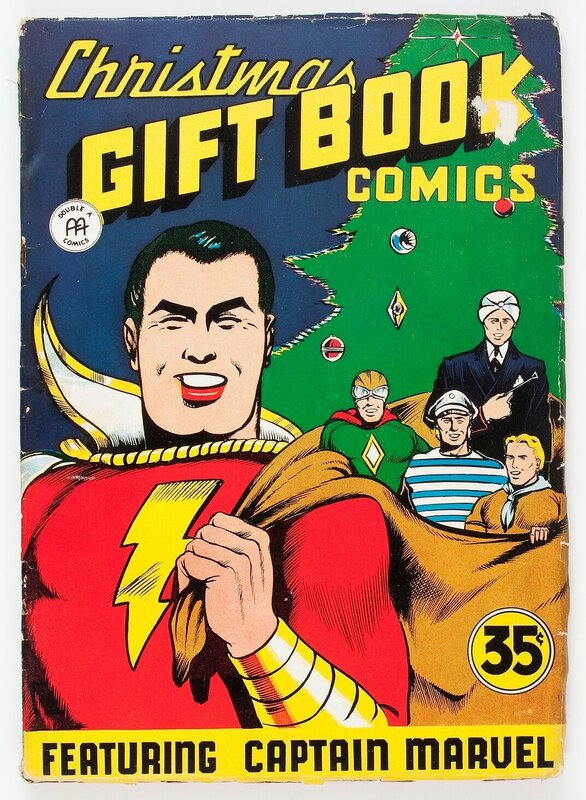 It’s the Super Comics Citren reprint of Pep 22. 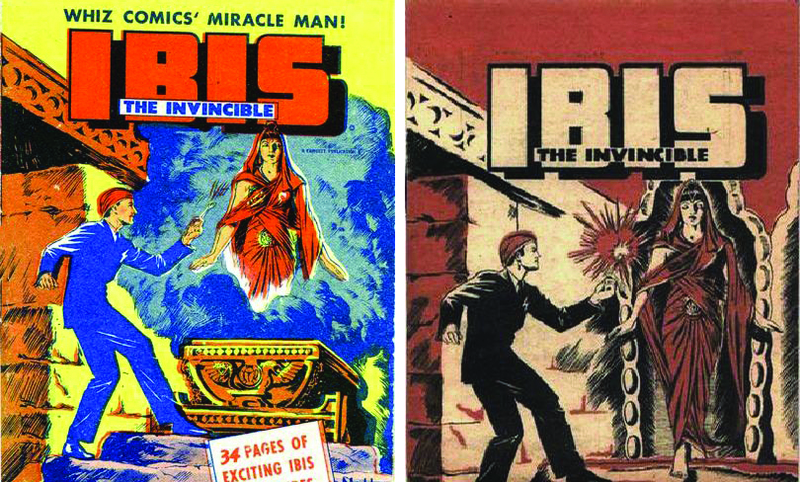 Of those 8 slabbed copies, 5 are restored. 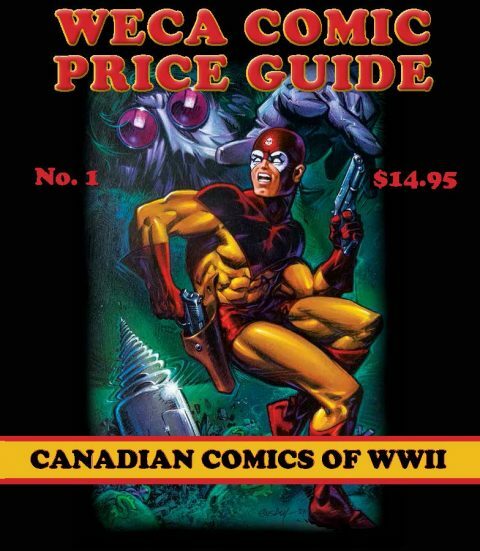 I’ve never really understood the appeal of this comic since it’s just a Canadian reprint variant of Pep 22 with an altered cover that probably came out six months after the original but it’s among the priciest of the WECA comics and seems to be on par with the 1945 Nelvana compendium. Next down the line is Wow Comics No. 1 which has accumulated 7 slabbed copies, all universal grade. This may be understandable in a way because Wow 1 had a second and perhaps third printing (all of which are indistinguishable) because of its popularity when it came out. In third place are Dime Comics No. 1 (6 universal graded copies), the 1945 Nelvana Compendium (which also has 6 universal graded copies), and F. E. Howard’s Super Comics Vol. 2 No. 5. 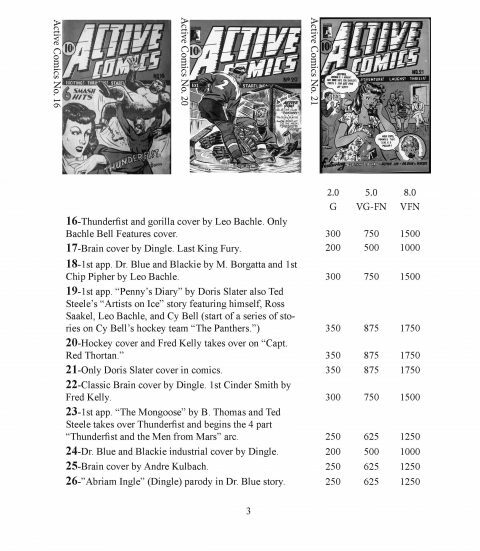 There is also a less significant issue that has 6 slabbed copies, and that is Grand Slam-Three Aces Comics No. 49. What this seems to say is that here is a genre, niche, or whatever you want to call it, in comic collecting where most books are scarce and where very, very few show up in high grade. This, of course, raises the question as to whether such scarcity helps the collectability of this genre, or works against it? There are probably similar genres of scarce books, but not ones that have a run through such a large number of collectible books (over 750) and that are held together by the appeal of a collective historical and cultural thread. 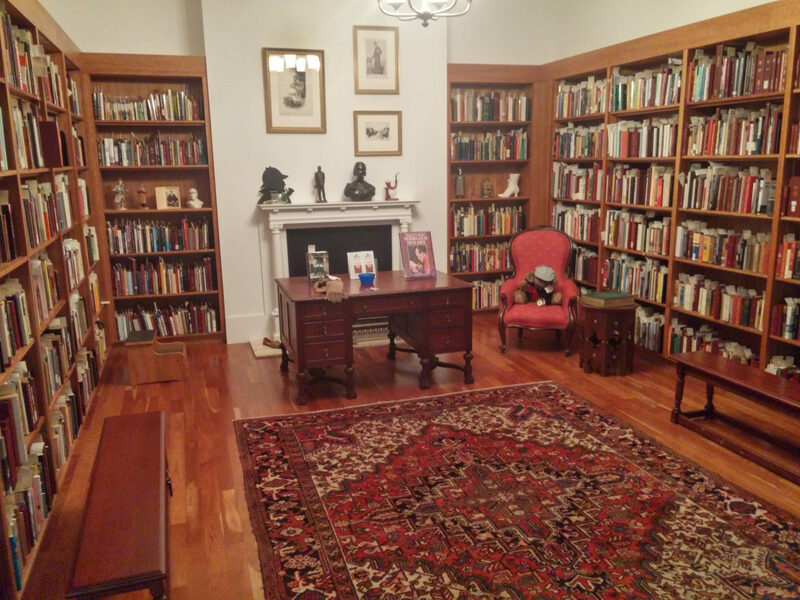 A couple of weeks ago, I found myself on the top floor of the Toronto Reference Library, just outside a room designed to resemble Arthur Conan Doyle’s study in the area called the Baldwin Collection. 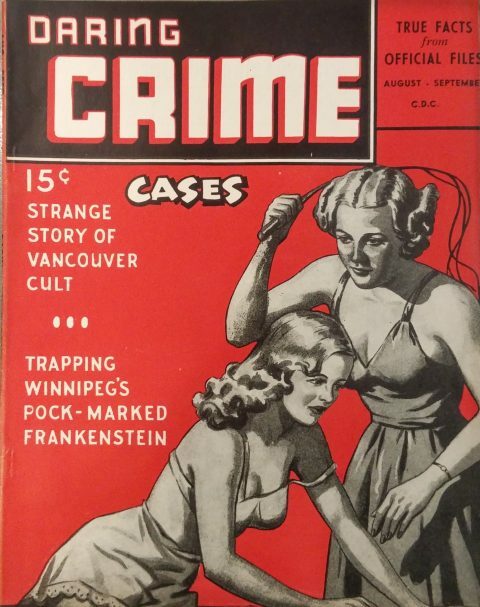 I was at a table next to a trolley holding 226 Canadian pulp magazines published in Toronto between 1941-1950. It would take more than the Sunday afternoon I had to look through them, but I did get a couple of good cover pictures. It’s well worth a trip up those open, glass-walled Reference Library elevators. Here are a few of the pulp pics I able to get. There’s a luridness here that doesn’t seem to come into comics until SOTI times and the rice of EC crime and horror. 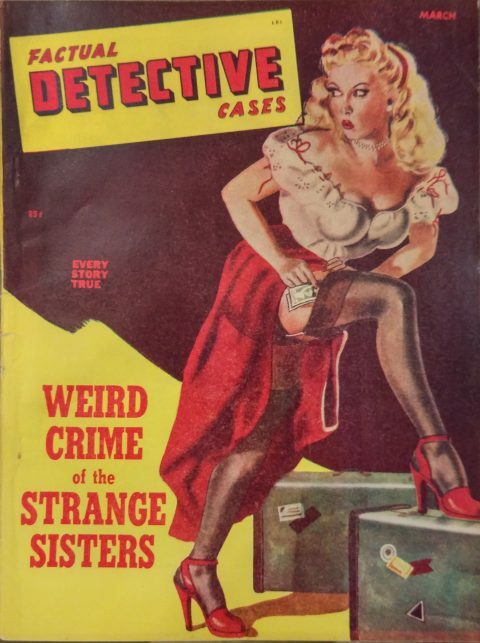 This is a Harold Bennett cover. 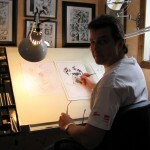 Bennett drew a story called “Rocky Summers” in Active Comics No. 27 and the cover and a couple of stories for Rucker’s Battle Heroes. 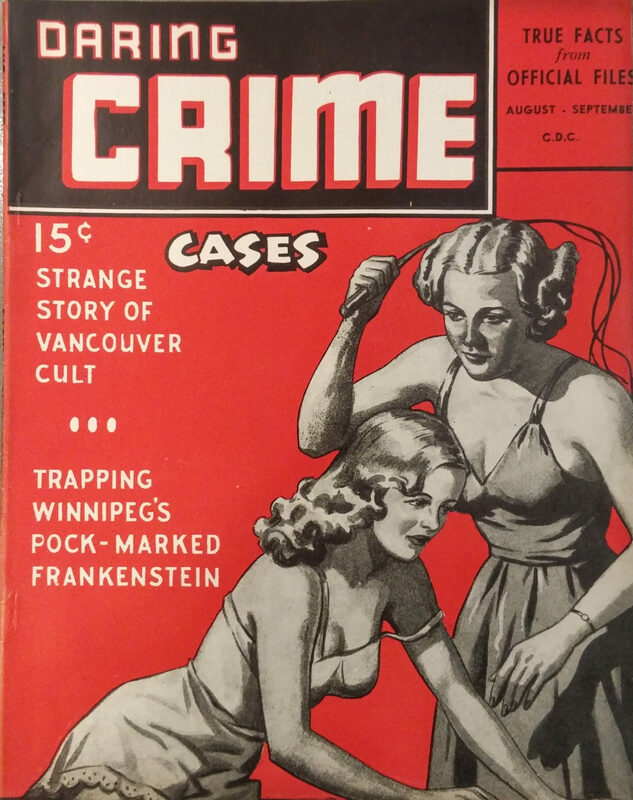 Those of you in the Toronto area will also find perhaps the best pulp collection in the area at the science fiction themed Merrill Collection on the top floor of the Lillian H. Smith Library near College and Spadina. Now, let me turn to a little bit about some Anglo-American miscellany. 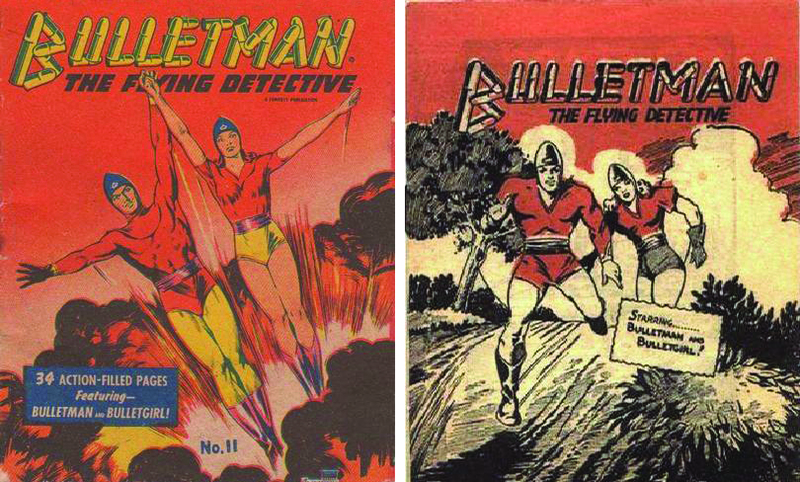 Anglo-American was a Toronto-based company that had one of the most popular heroes of the WECA era: Freelance. 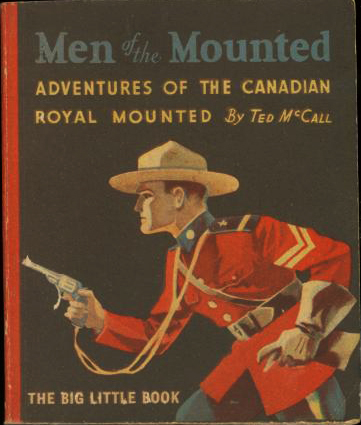 Its books don’t seem to be given as much collecting love as the those from Bell Features and Maple Leaf publications and it is perhaps best remembered for its lower production standards when compared to the product put out by the other Canadian companies. 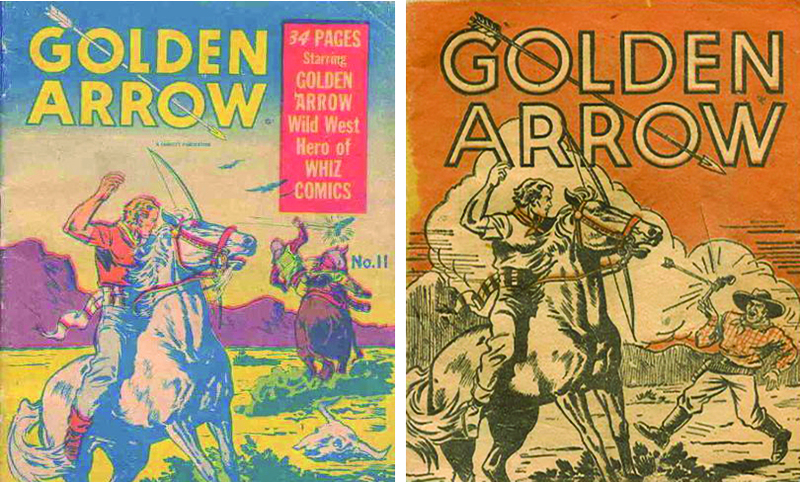 Until its flip over to four-colour in the final year of the war, its covers were mainly two-colour and printed on non-glossy heavier stock paper. 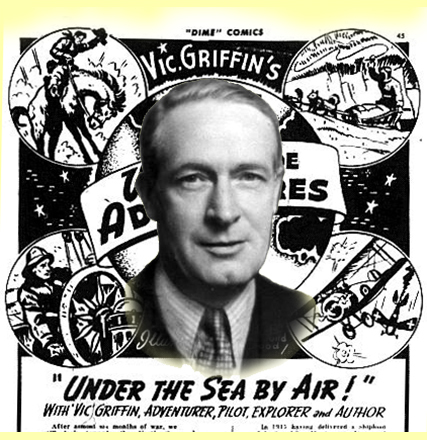 Anglo-American was also remembered for making a deal with Fawcett at the start of 1942 to begin redrawing a number of Fawcett’s hero scripts. In 1943, Anglo-American issued a number of miscellaneous one-shots that are now very hard to find. 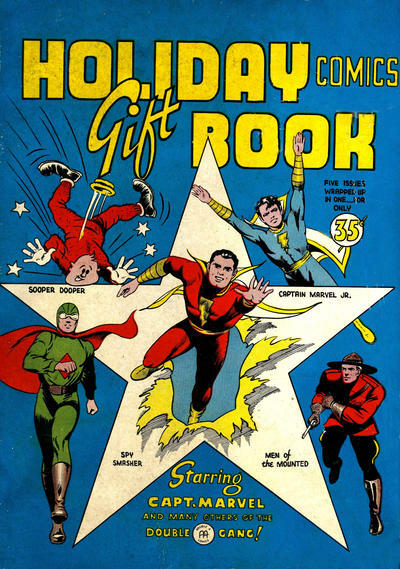 Among them are four Mighty-Midget Comics featuring Capt. 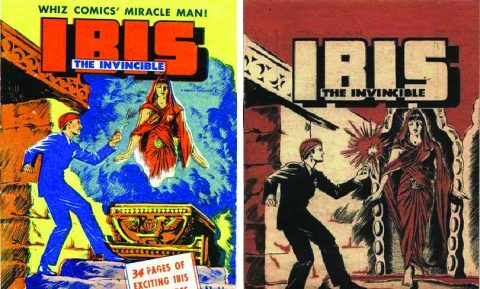 Marvel Jr., Ibis the Invincible, Bulletman, and Golden Arrow. 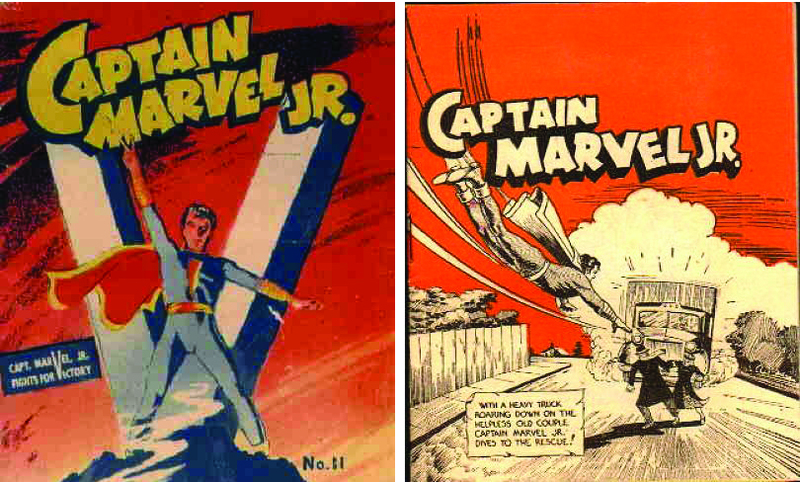 In the U. S., Samuel E. Lowe & Co. published 18 Mighty Midget Comics between 1942 and 1943. All were a smaller-sized comic, roughly 4” X 5” and Anglo-American decided to try this out with those four Canadian issues. Here they are lead off by they’re respective American counterpart. Anglo-American also released a couple of Giant remainder type comics along the lines of Bell Features Colossal Comics. They glued a number of remaindered issues together and slapped new covers on them. The two that came out were Holiday Gift Book Comics and Christmas Gift Book Comics. Jim’s copy has five Anglo comics and all appear to be the War Economy editions which were Anglo books put out in 1943 which had a reduced page count because pages were reduced from the normal comic size and printed two to a page in the War Economy editions. 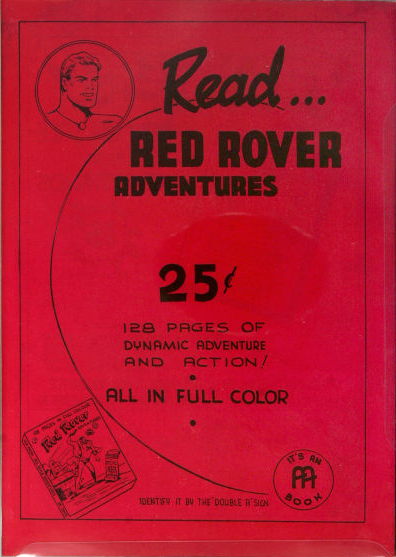 Anglo-American had one other giant comic called Red Rover Adventures. 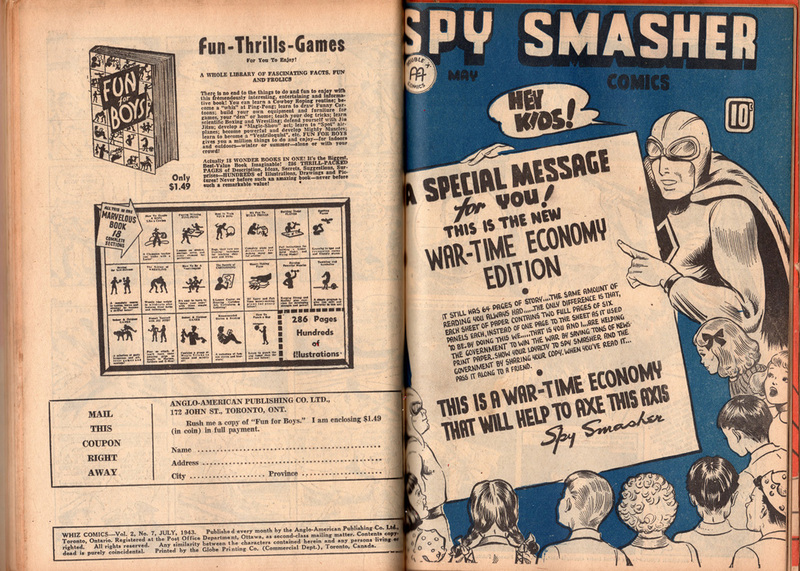 It sold for 25 cents and must have been put out towards the end of the war because it was full-colour and ads exist for it on the back cover of Grand Slam-Three Aces Comics No. 44, for example, but, as far as I know, nobody has one, nor has ever seen one. 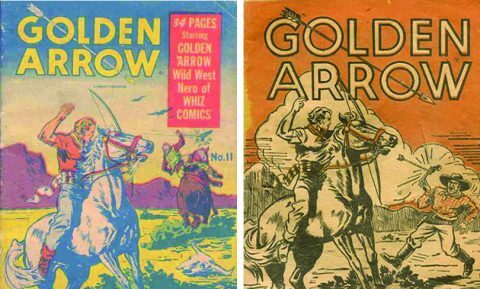 One other WECA comic needs to be mentioned in this context because it has all the appearance of being an Anglo-American comic of the period. 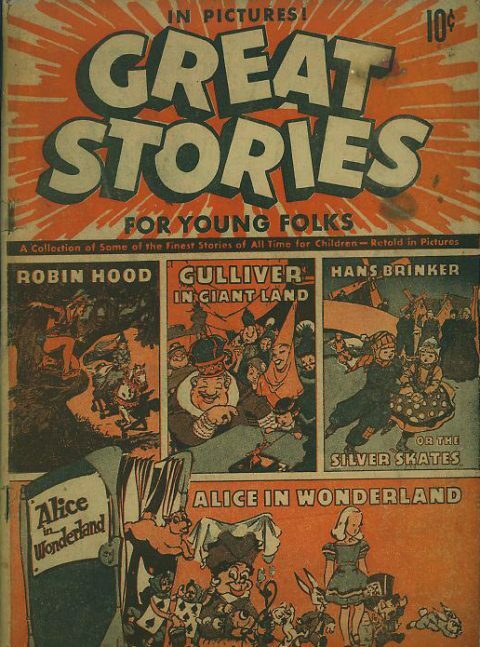 It was called Great Stories for Young Folk and contains black-and-white reprints of U.S. Parents’ Magazine kids’ comics. It was published in Toronto by Garden City Press in 1943. Just an oddity…. 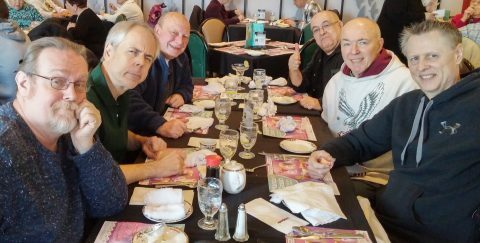 Just to close, we had a gathering of what we’ve come to call ‘The Over The Hill Gang’ at the Mandarin in Hamilton on Friday. 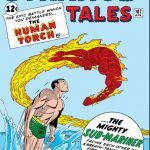 We all have had or still have some sort of experience in or connection to comics and we get together to have a meal and talk about them or about whatever we want to talk about. There are some wonderful dynamics and we only occasionally come to the brink of fisticuffs, but it’s always worthwhile and lots of fun. Here’s a pic with me in the back-left corner and Vince Marchesano giving the thumbs up across from me. Next to me in the middle of the left row is Hamilton comic publisher Mark Innes next to him at the front of the row is James Waley. In the middle of the right row next to Vince is Ron Kasman and at the front of that row is Art Cooper. I always thought that if we would ever bother to record our conversations at these meeting tables, they would make a great podcast. I look forward to the next one. Ivan, this was a fantastic post, even viewed from the perspective of a south-of-the-border near-completely-ignorant-of-WECA-books guy like me. 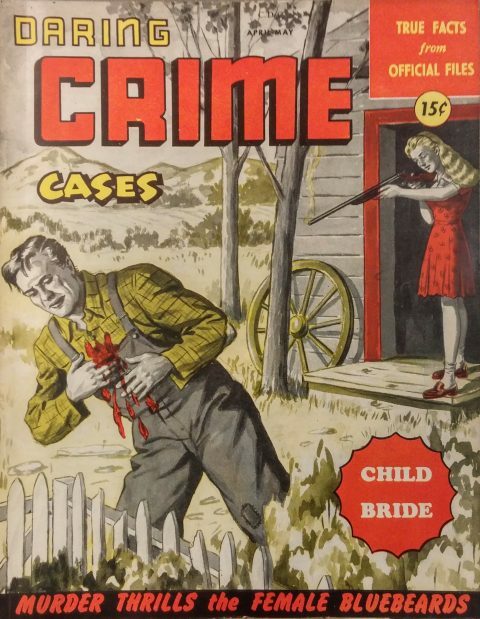 That Daring Crime Cases cover is off the hook. Please do follow up on that podcast idea, I’d love to hear the thoughts from your not round table. 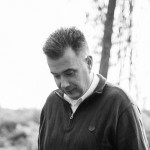 Another interesting article. Love reading about that time period. Can’t wait for the book to come out. The Steacy cover looks great. Although I prefer the blue costume. Thanks, Chris. Maybe I can talk the guys into recording one of our sessions, but I have the distinct apprehension that it will come out more like the Three Stooges than a hi-octane Con panel. 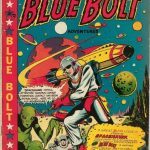 Peter, I don’t think Speed Savage’s uniform on any of the Triumph covers or on the 1945 compendium was ever standardized. 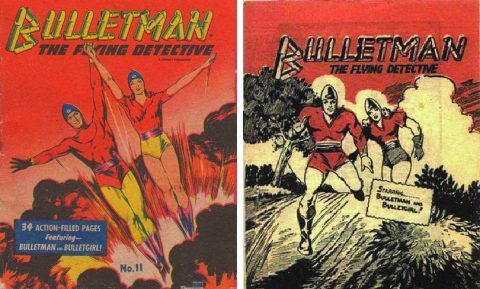 The covers were the only colour parts of these comics and there never seemed to be any continuity with the colours of Speed’s tights. 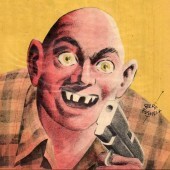 Hey Ivan how old do I have to be to gain acceptance into the over the hill gang? Walt, the fact that you were accepted at one of our sit-downs means you’re sorta in, but the final step is to accompany us on one of our missions and play a key role in rescuing one of the small towns in Southern Ontario from a mean sheriff. Seems like the more people like you and others dig Ivan the more there is that comes to light!